With a soft rain that resulted in a cool evening in the Shed, last night, the official Tanglewood 2016 season was launched with Canadian conductor Jacques Lacombe and violin soloist Joshua Bell. The program included Ravel's "Albordada del Gracioso," Saint-Saens' Violin Concerto No. 3 in B Minor and Prokofiev's Symphony No. 5 in B Flat. There was a gala for patrons and critics were treated to snacks on the media porch. Admittedly there was a bit of a damper in what so far has been an unusually hot and dry Berkshire summer. While opening night for lovers of classical music for many it felt more like mid-season. With an effort to broaden appeal and lure a more diverse and hopefully younger audience already there have been ten concerts that have drawn some 100,000 visitors. The targeted annual attendance is more than 300,000 visitors. This season started mid June with country music legend Dolly Parton. There were also legacy appearances by Brian Wilson, Jackson Browne, James Taylor and Bob Dylan. While these events have sold well, and there is no argument with the bottom line, it is difficult to say that Tanglewood management has reached that all important younger demographic. The thinking is that the non classical audience will return for more of the Tanglewood experience. BSO management has stated that when possible, based on quality and availability, they will continue to stack the shoulder seasons with popular artists. During high season the argument is that those nights are difficult to work into the primary commitment for BSO rehearsals and concerts. While beefing up attendance it is not likely that impressive numbers boost the bottom line. Pop acts generally get as much as 90% of the gate. Venues try to turn a profit through parking, concessions and merchandising. Tanglewood gets no benefit from these perks as parking is free, half time concessions are marginal, and merchandising is soft. The real beneficiaries are the hotel and hospitality industry which has had a boom from high attendance and great weather. By this point in the season they are cruising toward comfortable profit margins. This boost is reflected in more plans to expand beds and sustain restaurants. There is some talk of extending the fall season but on many levels Labor Day proves to be inflexible. After that one flirts with bad weather and hurricane season. It was enough to swamp the Tanglewood Jazz Festival. It has been replaced with late season pop programming like Harry Connick, Jr. last season. This time things wind down with the teeny bopper band Train (a repeater) and the disco dinosaurs B-52s. All of this fancy dancing, so to speak, is to ensure the sanctity, security and longevity of the primary focus of sustaining Tanglewood as a summer home for the BSO and a training facility for the next generation of artists. A case in point of that mandate was the concert we heard last night. Because of inclement weather the lawn attendance was sparse but the Shed was packed. Much of that was the appeal of the still youthful, violin super star Joshua Bell. He is among the relatively few young classical performers with marquee drawing power. In contrast to the white dinner jackets and white gowns of the orchestra and conductor he was casually attired in basic black. He was svelte and understated but between movement of the music of Saint-Saens he decorously wiped sweat from his brow. This belied what appeared to be an effortless ability to explore the most complex and alluring aspects of the music. The audience was treated to a virtuosic performance of the demanding and varied moods of the music. His appearance was preceded by just eight minutes of Ravel’s Alborada del gracioso featuring pizzicato strings and doubled harps. Prokofiev’s Symphony No. 5 comes from the conflicted and patriotic war years of the composer who had returned to Mother Russia in 1933. It was first performed in America toward the end of the war in 1945. It was last heard in Tanglewood in 2008 conducted by Andre Previn. The brash passages of brass were particularly Slavic and emotionally exotic. At the time the music was framed by patriotism which by now might be perceived as jingoistic and overstated. By then in addition to the anxieties of global war Soviet artists worked under the reach of Stalin and his punishingly horrific censors. One had to toe-the-line and serve the need for creating agit-prop. Between movements we were intrigued by the long, introspective pauses of the conductor. More than define transitions between movements in the manner of most conductors, Lacombe seemed engaged in some Faustian pact to summon the power and inspiration to attack the next movement. This pause and then pounce approach evoked passionate and emotionally scorching responses from the orchestra. 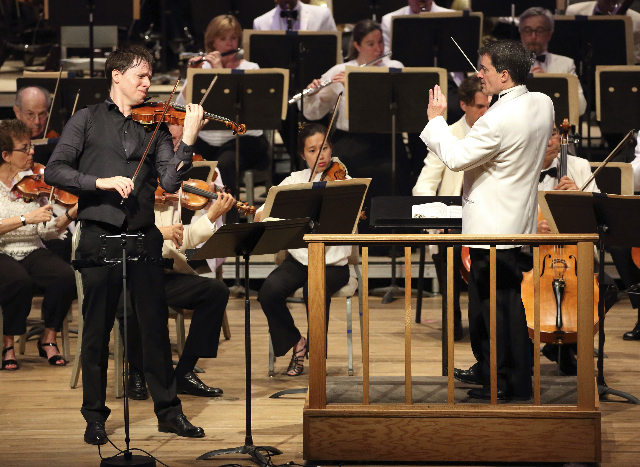 Lacombe yet again opening a Tanglewood season appears to reflect an effort to find and sustain the next generation of conductors. That was reflected in the bold move of hiring Andris Nelsons who is on the verge of committing to spending more time in the Berkshires. 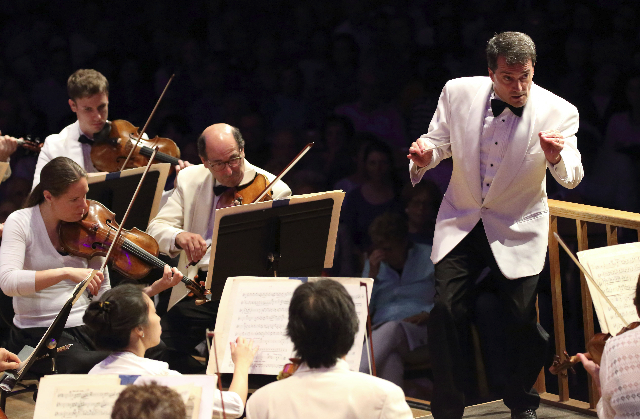 On all levels Tanglewood is in the midst of youthful rejuvenation and bracing itself to buck the trend of declining audiences for classical music. It’s a bold move in the right direction. BSO courtesy photos by Hillary Scott.